This is to comedies what Gone with the Wind is to epics. It will never die, because it responds to and calls forth such human emotions. It isn’t dirty. There’s nothing mean-spirited about it. There’s nothing sneering or sniggering about it. It’s just wholesome. We want to be free. We want to have a good time. We know we’re not going to be able to all our lives. We know we’re going to have to buckle down and work. We know we’re going to have to eventually become family men and women, and have responsibilities and pay our bills. But just give us a couple of good days that we can look back on. I think when John Hughes wrote, produced and directed Ferris Bueller’s Day Off, he was writing about a human need as basic as the human need that Jefferson wrote about in the Declaration of Independence: the need to be free, and to pursue happiness. Life, liberty and the pursuit of happiness – very basic stuff. And I don’t know that there’s ever been a happier movie. It’s a movie that you cannot watch without feeling really, really great. …Everyone wants to be Ferris, and what an amazing guy Ferris was. He didn’t do a single thing to hurt anyone during the course of the movie. Maybe he sort of made the principal back down, but other than that, he didn’t hurt anyone else. It’s sort of like, if I may use this very extreme analogy, the New Testament. In the New Testament, Jesus Christ does not hurt anyone. In the Old Testament, there’s a lot of battles where people are killed, but in the New Testament, Jesus doesn’t hurt anyone. Ferris did not hurt anyone. He just freed the people he was around. Here I am, I'm 60 years old. I'm an old guy at this point. And even now, when I walk down the street in Georgetown...on a summer night, when all the college kids are there to be summer interns, every few steps, someone says "Bueller...Bueller...anyone...anyone..." I love it. Because, you see, Ferris Bueller liberated me, too. Finally, in Episode 85, entitled "Court Martial," a radio broadcast informs the castaways that a board of inquiry convened to investigate the loss of the Minnow has found the Skipper guilty of negligence. To prove to the Skipper that he was not at fault, the Professor suggests the castaways reenact the final hours of the storm. Doing so reveals that it was Gilligan's failure to secure the anchor to the boat that caused the sinking. This discovery leads both the Skipper and Gilligan to experience unbearable guilt. Just as things are at the blackest, however, good news arrives: after further study, the board has changed its verdict and concluded that the real cause of the wreck was a faulty weather report that had failed to predict the storm. In Episode 16, entitled "Plant You Now, Dig You Later," Gilligan unearths a treasure chest while digging a barbecue pit for Mr. Howell. 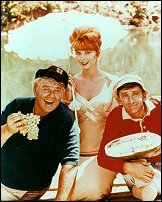 When Mr. Howell claims that he owns the chest because Gilligan found it while working for him, the Skipper insists that Gilligan is the owner because he discovered it. To settle the matter, a courtroom (complete with a judge's bench, witness stand and an American flag made out of flowers and starfish) is built and a trial held before the Professor (who substitutes one of Mr. Howell's capes for a judge's robe). Following a hard-fought contest, he rules that the chest should be treated like the island's other natural resources and, as such, belongs to all the castaways. Unwilling to share the chest, Mr. Howell immediately buys out the other castaways for $ 500,000. Much to his chagrin, the chest is then opened and found to contain nothing but old cannonballs. In Episode 74, entitled "Where There's a Will," Mr. Howell rewrites his will to thank the others for their attentions during a recent illness. The new instrument leaves a large bequest to each of the castaways: Ginger receives a diamond mine, the Professor is given a railroad, Mary Ann is promised two plantations and a fleet of cars to travel between her properties, Gilligan is granted an oil well and the Skipper becomes the owner of Denver. Through a series of miscues, Mr. Howell subsequently becomes convinced that the castaways are planning to kill him to collect their inheritances. All is put right, however, when he later learns that the "old bore" they intend to kill is a wild boar to be served at a dinner honoring him for his generosity. In Episode 27, entitled "New Neighbor Sam," the castaways become terrified after overhearing a group of gangsters. When it turns out that the "voices" are coming from a parrot, the Professor and the Skipper decide to interrogate the bird to learn what else it knows. Jumping to its defense, Gilligan insists that the bird be allowed to speak to an attorney before answering any questions. In Episode 52, entitled "Not Guilty," a crate washes up on the island. Inside are some old newspapers from Honolulu which report that someone aboard the Minnow might be a murderer because each had been shopping in the same store on the same day as Randolph Blake, a man who turned up dead just as the Minnow had set sail from Honolulu. With their imaginations running wild, the Professor proposes that the castaways reenact the scene in the store to determine the killer's identity. To their great relief, doing so proves that the incident had been an accident: slamming the store's door had released the trigger of the spear gun that had killed Blake. In Episode 38, entitled "Beauty Is as Beauty Does," the castaways hold a beauty contest to select Miss Deserted Island. When the others are unable to agree upon a winner from among Ginger, Mary Ann and Mrs. Howell, Gilligan casts the deciding ballot for Gladys, a chimpanzee he had found on the island. His reason for doing so rests on solid legal grounds: as the tournament's only native, Gladys is the sole contestant eligible to win the title. In Episode 83, entitled "Gilligan Goes Gung Ho," the castaways decide they need greater law-and-order. Therefore, they appoint the Skipper to be their sheriff and Gilligan to be his deputy. Adopting a "by-the-book" approach, Gilligan soon has the castaways under arrest. Unfortunately, his zeal costs them one of their best chances to be rescued: while they languish in jail, a rescue plane flies over the island. Over at Marginal Revolution, Tyler and Alex have of late been pondering the role of animals in the social calculus -- namely, the question of whether, and to what extent, animals matter. Surely it seems reasonable to count the welfare of animals -- or at least selected high-cognition animals -- for something rather than nothing. But this throws moral calculations into a funk. Even if you count individual animals for very little, there are many billions of them. For my part, I'm less than troubled by my own specieist instincts. The reason, I suppose, is that, from a social contractarian point of view, animals just generally aren't parties to the negotiation. Besides their unfamiliarity with the language and the lack of opposable thumbs making signatures difficult to obtain, I just don't trust their sense of reciprocity, either with us, or with one another. I love and am eternally fascinated by bears, but the experience of those unique souls who have chosen to commune with them suggests they aren't prone to hold up their end of the bargain. Nor do they particularly trust you to hold up yours. Which is not to say that some form of reciprocity is impossible to maintain with an animal, but there remains in such relationships a significant assymetry to the balance of power. Master provides Fido with Puppy Chow, health care, and warm doghouse. Fido provides master with his slippers, a frisbee partner, and a babe magnet down at the local walking trail. Despite the language barrier, both seem to implicitly proceed from the Schelling point that outward aggression on either's part will jeopardize the terms of this arrangement as a going concern. Yet, despite this micro relationship, Fido has no place in the macro compact among humans to which his master belongs, not even the 3/5ths of a person regarded under chattel slavery. Perhaps this is inequitible, but I don't find it at all troubling, and don't share Tyler's desire to justify a place for Fido at the table. Down, boy...this is for people. The reason to think deeply about ethical matters is the same reason we should think deeply about nutrition - so that we can overcome our intuitions. Tyler argues that we don't have a good approach to animal welfare only because he is not willing to give up on intuition. Tyler asks (I paraphrase) 'Would you kill your good friend for the lives of a million cats? What about a billion cats?' He answers, No, but says "Yet I still wish to count cats for something positive." My answer is not only Yes it is that we do this routinely today. The introduction of "your good friend" (or "children" in Larry's example) engages our primitive intuitions and feelings and that is why Tyler's answer goes awry. But consider, last year Americans spent more than 34 billion dollars on their pets. That money could have saved human lives had it gone to starving Africans. I think Alex is wrong on several counts, but more importantly, I think he's copping out on directly addressing Tyler's inquiry. Alex says that many people already value animals -- at least, they value the animals they own -- and demonstrate their preferences by spending money on those animals' upkeep. This is true, but unremarkable. Many people also value their homes, and similarly spend many billions not only purchasing, but improving and maintaining those homes. Any broadly utilitarian set of ethics would have no trouble incorporating both sets of human preferences, and acknowledging that people value some things more than the well-being of their fellow humans. In fact, people often seem to value most things more than they do the well-being of their fellow humans. But it strikes me this was not at all what Tyler was on about, as he seems to have no concomitant concern about how to account for the welfare of one's home. He seems to proceed from the notion that animals have intrinsic value, not just the subjective value different people ascribe to them. Or, perhaps, he is just unwilling to accept a utilitarian approach to moral theory, in which respect he is hardly alone, though I don't see why the issue of animal welfare should confound the matter any more than a host of other concerns. I also think Alex's comparison of moral instincts to nutritional instincts is faulty. It is not that our predisposition to crave sugar and fat is wrong, but that it isn't perfectly applicable to all scenarios in which modern man often finds himself -- namely, inhabiting a world in which sugar and fat are far more plentiful than our ancestors found them to be, while many other nutrients are necessary to sustain long-term health. But if one's evolutionary predisposition to feel varying degrees of empathy toward concentric circles consisting of kin, tribe, race and species is similarly ill-suited to the particulars of modern life, then pure reason would seem to suggest abandoning such empathetic inclinations wherever practical. Sociopaths everywhere are vindicated. What Alex wants to say is that, where moral reasoning and moral intuition prove incompatible, we should abandon moral intution and stick with moral reasoning, much as reason forced us to abandon the more intuitive Newtonian framework for the strange world of relativity, and even stranger world of quantum mechanics. But that argument is valid only if moral concepts, like the concepts of physics, have empirical truth value. If they do not -- and I remain, well, skeptical -- then attempting to apply reason to move past intuition toward a fuller elaboration of moral theory amounts to an updated version of theological debates about how many angels can dance on the head of a pin. It's spinning the straw of intuition into golden nonsense. I agree with Alex on this much: our moral intuitions are certainly inconsistent, and frequently incompatible. As evolutionary adaptations, they've proved a stable enough paradigm to ensure the survival of the species, but that stability obviously has its limits. Struggling to reconcile incompatible intuitions raises the costs of social bargaining considerably. But by moving away from those intuitions toward abstractions that few would accept, Alex misses the main value that moral intuitions still hold -- not that they're true, but that, at the very least, they're common.